Welcome to my family which is based on the Scheutz family but also includes other branches like my mothers side of the family and several side and in-law branches. This is a growing tree and I know there are other relatives out there who are interested in helping with their parts of the tree. Some of you have already approached me and given me very valuable information - thanks. If there are no sources which are verified like church books or similar the information can be wrong. Please make sure you verify any information you are using from this tree yourself. I am working on verifying all information bit by bit but it all comes down to how we 'decode' the handwriting of others. I wouldn't call it my ancestors because I share them with lots of other people. It is more a story about working and middle class Sweden showing the ever present migration of people. Some had success others not so much, most choose to follow in the footsteps of ancestors but others were brave enough to choose a different path. This is a story about craftsmen like glassblowers, smiths, farmers, carpenters, miners, iron workers and soldiers. Many of the women were very strong to survive poverty and hard work, many of them lived long but not so easy lives. This is why I choose to call the tree 'A story of Swedish craftsmen and strong women'. If you would like to receive the newsletter with stories and updates please register here http://eepurl.com/ck9T-D. Since I lost all the old blog entries with the main website that I had to delete I will have a new blog on http://scheutz.home.blog/ . On this blog I can write a little bit more than I can do in the news section on this page. This photo is from a family party in Skinnskatteberg. We are still trying to identify all people in the photo. This far we know who three of them are, but looking at some of the women they clearly must be related. My grandparents family names were Scheutz, von Mühlenfels, Johannesson and Lundahl. 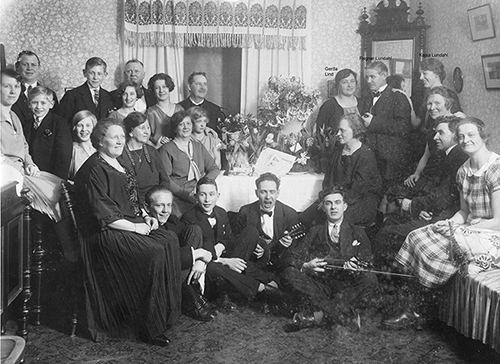 The great grandparents were Scheutz, Holm, von Mühlenfels, Nordling, Johannesson, Johansson, Lundahl and Lind. Scheutz is connected with the glass industry in Sweden and our first ancestor in the country came in the early 1700's from Bohemia. Holm we don't know that much about but the name comes from a man who fostered my great great grandfather (parents unknown). Further research show the Holm family is rooted in Skåne in southern Sweden as is all the branches from Holm. There is no particular occupation here but I have found some mill workers. They seem to have lived all over the county. Maybe the future will show if they also lived there when Skåne was a part of Denmark? Von Mühlenfels is a family with roots in Pommern, today in Germany but also for about 200 years Swedish, many of whom served as soldiers in both the Swedish and Pommerish Armies. This is a family connection by adoption but the only family my grandmother knew. Her real family was Augustsson. Nordling came from counties around Stockholm and worked as inn keepers and merchants. Johannesson is deeply rooted in Dalsland and they are all farmers. Johansson is still one of our mysteries and waiting to be solved. Lundahls were initially gardeners and before that farmers and from Stockholm and counties near Stockholm. Lind takes us to Bergslagen and the iron industry - ironworkers and miners. August Johannesson after some successful pike fishing. Coming from a farming family in Dalsland he became a masterpainter in Stockholm. Fishing was just something he did at the summer house in the archepilago. There are of course other occupations in all branches but these are the main ones. Through Scheutz and glass we are also connected to one of the smith families Schult/Schultz/Schoultz. Originally Schult but today the latter two versions are used, and there is no connection to von Schoultz which is a total different family. The photos in the logo are all from our family. If you are interested in what connections the different photos have or who they might be please contact me. Om du på något sätt ingår i släkten och vill vara med och bygga upp denna sida (databas) klicka på login och ansök om ett nytt konto. På så sätt kan du också se nu levande personer och aktivt bygga upp sidan. Om du har jättemycket material så är det nog lättast att skicka en gedcomfil till mig. If you belong to the family and want to help with the research please request an account so you can log in and get access to all information. When requesting an account please let me know how you are related to the family tree. This family tree was last updated on March 6, 2019. February 24, 2019 - 7:52:22 p.m. This time I was contacted by someone who thought that maybe his great grandfather was the brother of my great grandfather. A week later, massive chatting on FB messenger, swapping of photos and checking of DNA matches in Ancestry, My Heritage and FtDNA we now have added not one but two more branches on my maternal grandmothers side of the tree. With possibilities of it turning into four branches instead of two. I now have contact with new third cousins in Sweden and USA/Canada. February 17, 2019 - 9:53:44 a.m. The old layout of the website is now working as it should again. Enjoy. January 25, 2019 - 5:32:00 p.m. The website got hacked again and this time I have decided to only keep the actual genealogy part webtrees for the time being. I have updated to the latest version of webtrees but sadly it seems the theme I have been using isn't working properly with this theme. I am sorry but you will have to put up with this for now. I will as soon as there is time be back with more updates. For now we will remember those who have passed away recently among them my father. July 11, 2018 - 7:08:49 a.m.
During my holiday I will visit Sweden and go to the Genealogy days in Växjö 1-2 September. I am going to listen to at least two talks on subjects of interest for us who do family research, and hopefully meet some other researchers that I have been in contact with. I will give you an update after the event. June 28, 2018 - 7:21:24 a.m.
Just a little update - on top of the continueing work of verifying as much as possible, building up timelines for specific ancestors etc I do the DNA bit as well. I now administer 5 kits including my own. The rest of the family decided to also do a Family Finder test with FtDNA. We now have four results and the fifth will be ready in a few days we hope. The advantage have this far been mainly for me and my sister. Due to our parents tests and linking our matches with them we now have a better understanding of which side of the family we have to start looking at for all the un-recognised names among the matches. We can also see a pattern of which branches in the tree have been more active in DNA testing. More updates will follow.